Answer an uncommon essay question in four Powerpoint slides and win $500 in the latest Magazine reader contest. A $100 gift ($75 tax deductible) to the Magazine in its centennial year gets you a copy of a new book of campus photographs by Dan Dry. Make your gift online today. The Magazine�s Web log, updated every Monday, Wednesday, and Friday by 3 p.m. The Magazine�s online catalog of books by alumni. Notices are submitted by authors or their publicists. Screensavers & desktop wallpaper from the University of Chicago Magazine. The Magazine's monthly e-bulletin offering links to University and alumni news and programming. If you have any questions or problems submitting your new information, please contact the Alumni Association at 1-800-955-0065. 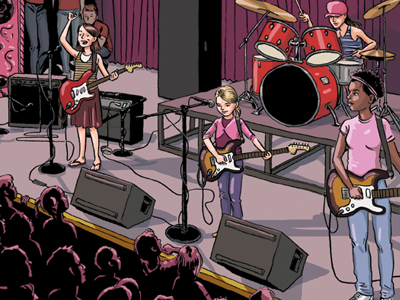 Cartoonist Jessica Abel, AB’91, rocks out. Harris School professor Jeffrey Grogger explores the connection between immigration—both legal and illegal—and African American employment. Robert Mitchell, MFA’91, created the 6 x 6–foot multi-media piece Untitled (Kennedy). When PowerPoint meets the uncommon essay question, we’ll be the judge. :: more "In Every Issue"